Finding the right gift for a new born baby is important, you want to make it a memorable and thoughtful gift. A great way to wish a new mom best of luck is a lovely gift basket which will be a considerate way of letting her know you care and are there for her during the challenging first stages of motherhood. We want to help you pick a good quality baby care present for babies so that every time it is used the new parents think of your good wishes. When buying a present for babies, you need to ensure that it is more functional than of a certain design because those first parenting months will require hard work and products that are useful can be helpful. There are two ways you can go about creating a baby gift hamper and that is making it yourself or buying an all-in-one gift set. Our genuine advice is to not spend too much time on this and get a pre-made shower set for babies. If you are not familiar with baby care, it is much better to trust products that are specifically made for babies and will include everything they need rather than you trying to find each item separately. There are a few more things you should consider before buying presents for babies. It takes parents so long to decided on the nursery design and colors so you need to be aware that every gift for newborn you want to get will match the design and colour scheme of the baby room. 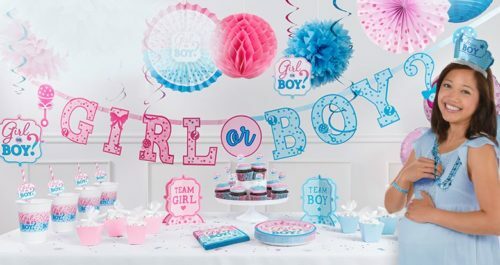 We would definitely suggest following the blue for boys and pink for girls rule as it has never really failed anybody but it is always good to double check with the soon to be parents before buying a baby shower gift. If the babies gender is not revealed definitely try to get a gender neutral coloured gift which can be yellow tones, purples or greens. The most important thing to consider when getting a present for a new born baby is how safe for babies it is. Make sure you are giving baby toys that are made out of soft materials and do not have small parts to become potential choking hazards. Many baby hampers contain wicker baskets which could be potentially dangerous to small children without parent supervision therefore choose a basket that is baby-proof. Many gift sets include baby bath products and it is important to ensure they are free from harmful chemicals and toxins for babies. The highest quality baby hampers will definitely include well known branded baby products. The best known baby care product brand is Johnson’s Baby and this is your best choice when it comes to buying baby care online. Make sure the new born shower basket includes products that you can easily check online and confirm their safety for babies. Our first pick is a wonderful nautical-themed present for babies which is perfect for any new born girl or boy. This baby gift is packed to the top with bath essentials by Johnson’s Baby which is a well regarded and safe baby care product company, small bath toys, diapers and a tiny little baby outfit. 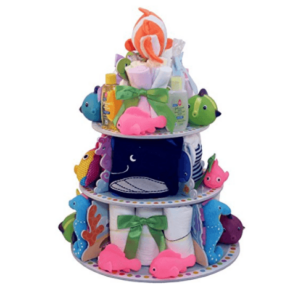 This baby set will compliment any water themed nursery and be functional at the same time. We love this set in particularly because it has gender neutral colours that you can gift to a modern couple that are not revealing their babies gender before he or she is born. Our main piece of advice – do not throw away the stand of this baby set because it will come in handy to keep it for decoration or serve as an additional place to put all of your child’s toys in the future. This beautiful newborn gift basket come fully wrapped with a big bow ready for gifting. A unique set of monkey themed gifts for a newborn baby are one of most adorable presents you can get on Amazon for a baby shower. 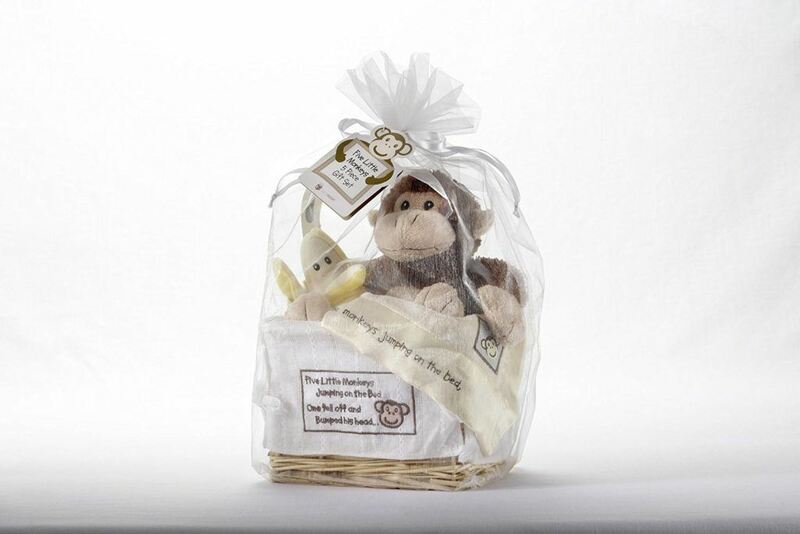 This baby hamper includes a cute plush 8 inch brown monkey that is holding a banana which also doubles up as a baby rattle, a satin-trimmed luxurious baby blanket, wooden door handle to let everyone know when the baby is sleeping and a natural wood gift basket. This top quality baby hamper comes thoughtfully wrapped in a sheer white organza bag and tied with a satin bow ready for gifting. Such a wonderful and gender neutral gift for baby boys or girls. We have heard reviews of parents not being able to take the monkey away from their children as they fall in love with it and take it absolutely everywhere! This baby gift hamper is specifically tailored for girl twins. This baby present includes plush teddy bears that will become the child’s favorite toy, soft baby blankets, baby bottles, baby bootie sets, embroidered bibs, baby hair care and even picture frames for their first baby pictures. We recommend this gift for newborns because it includes personalized gifts for twin girls and you can customize this present to include a message of your choice. This adorable gift arrangement includes a beautiful white basket which can be used for decoration or toy storage and it comes pre-wrapped to be gifted upon delivery arrival. A truly unique gift for a new born baby boy that will be the main attraction at a baby shower. This baby boy present includes a Radio Flyer red wagon instead of the classic wicker basket to make this baby present stand out. 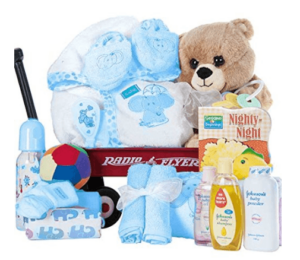 We guarantee you will get more than you pay for with this baby present set as it includes Johnson & Johnson baby oil, powder and shampoo, hooded bath robe with baby slippers, brown teddy bear, some small toys, a book for babies and much more. This is a wonderful present for a baby boy that will grow into a small man that and will be able to play with the amazing wagon that is included in the gift set. An adorable plush giraffe themed gift to welcome a new baby. Wonderful gender neutral colors will brighten up any nursery. 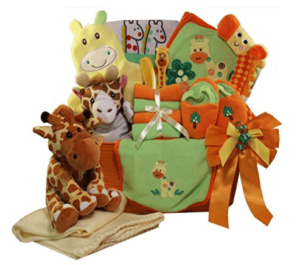 An adorable set of baby clothes, baby necessities and a useful neck pillow for feeding time are all included in this baby hamper. This great choice for a baby present will make any new parent excited to start their parenting journey. We love the plush selection of toys, blankets, and tiny baby slippers that this baby present set includes. This baby item comes completely gift wrapped and you can always add a personalised gift message. A unique tailored gift for girl and boy baby twins. This gift can make such a big influence in a new parent’s life and add a lot of valuable help since nobody has it easy with twins. Show your considerate support with a baby goodie basket that includes plush teddy bears for girls and boys, baby photo albums, slippers, bottles, hair brushed and much more! We love it when baby hampers are overflowing with goodies exactly like this. A truly lovely present for newborn twins that will look good in any nursery. Help your best friend prepare for the first few months of parenting with useful baby gifts. This monkey baby gift set is the best baby shower present if you are on a budget. If you are looking for amazing quality baby toys and blankets then this will do the trick and you will definitely send a message to the new parents of how caring and willing to help you are with the new baby boy or girl. Definitely the perfect gift for a baby boy or girl. 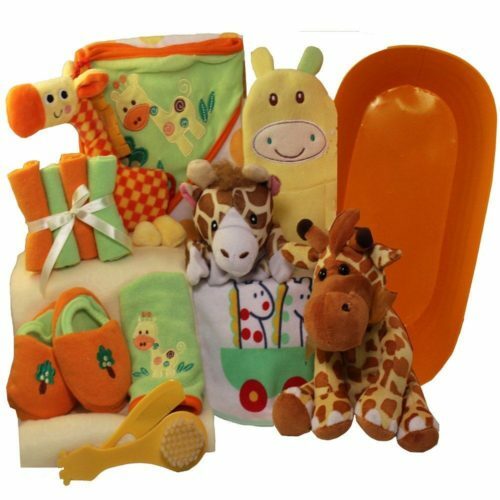 What makes it our top baby gift choice is the soft material the toys, blankets, and slippers are made out of. It is so important to ensure the newborn baby is comfortable during the first few months of his/her existence in this world so why not give them the best present they will ever need – comfort.